As you might imagine, my Swiss-Italian family is quite large and spread out, yet back in the day, we always seemed to find time to get together. 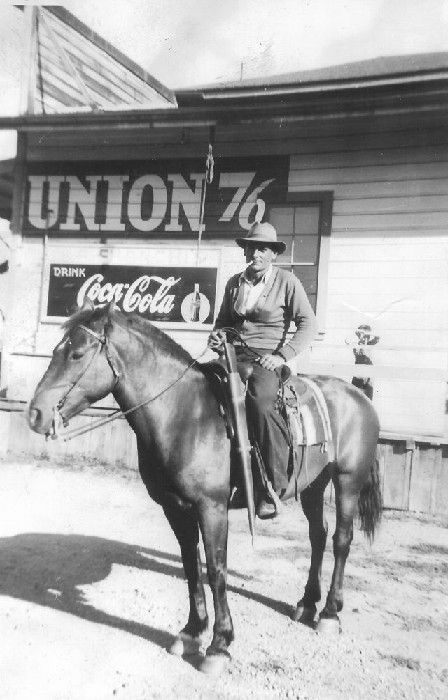 Some of my most cherished childhood memories stem from the gatherings at Nona Mary’s house. That was the family home, a place where there was always a spot at the table, even if you dropped in unannounced. A place where the kitchen table had so many layers of vinyl table cloths piled on, no one remembered what the original table underneath looked like. The old regulator clock mounted on the kitchen wall, a clock whose pendulum had frozen long ago, hinted that it was a place where time simply stood still.Â A place where old family traditions took center stage. Some of the best meals came out of that kitchen, always prepared with love and often with a healthy dose of vino. What can I say? Italians love their wine, so I was excited to learn that Gallo Family Vineyards was sponsoring this week’s #SundaySupper. 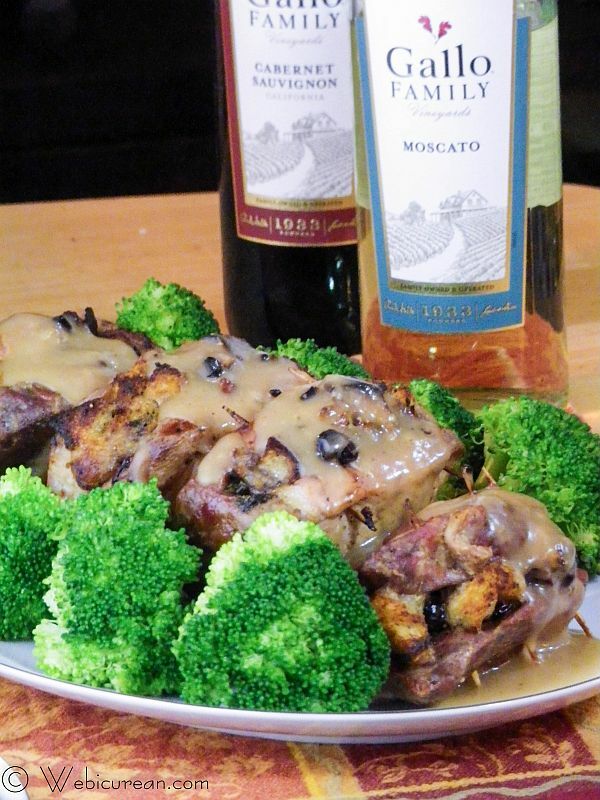 These Baked Stuffed Pork Chops with Moscato Gravy are my contribution to the table. Gallo wines have actually been a mainstay in our family kitchen for as long as I can remember. In fact, I can still hear my Uncle Joe smacking his lips as he enjoyed his glass of burgundy before dinner–he’d seat himself at the head of that funky kitchen table, pour some burgundy over ice (in a tumbler, of course), and he’d sit there, smacking, savoring each sip, and deep in thought as the swirl of the family kitchen worked its magic around him. Silly, I know, but a cherished memory nonetheless. We ate lots of chicken in those days, so more often than not, it was a big platter of drunken chicken that awaited him. Although he’d feign annoyance with my childish antics, we knew he savored those moments as much as he did his wine. What is it about the holidays that makes us wax nostalgic? Sigh. Maybe it’s in the wine. Maybe I just feel honored to be included in this special #SundaySupper event, as Gallo not only represents family but has been a part of our family for so long. And these pork chops? Whoa! Turns out Moscato is a great wine for savory dishes. Initially, I tried this same technique stuffing chicken breasts instead. Those were really good, but the pork won out. The Craisins and the pecans in the stuffing help marry the savory components with the sweetness of the wine, and it’ll leave you wondering why you haven’t been cooking with dessert wines all along. First, we need to make the stuffing. Cut the bread into cubes, and set that aside. 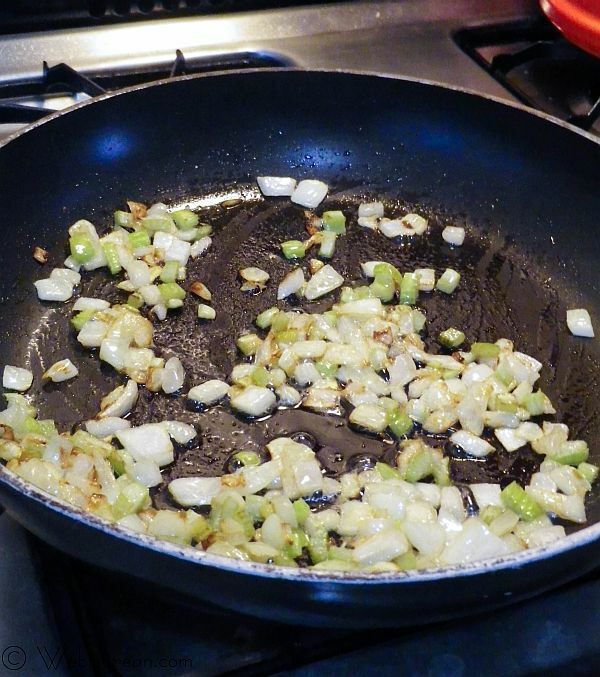 SautÃ© the onion and celery in the butter over medium heat until the onion starts to brown. Add the bread to the pan along with the remaining stuffing ingredients, and toss until combined. Using a sharp knife, cut a pocket into each chop, and fill with 1/4 of the stuffing mixture.Â Secure with toothpicks. Melt the butter in a large skillet, and brown the chops on each side over medium heat. Transfer the chops to a baking dish, standing them upright. De-glaze the skillet with the Moscato wine, then pour the wine/pan juices over the pork chops. Cover with foil, and bake 30 minutes, then remove foil and bake an additional 30 minutes. When the pork chops are done, transfer to a serving dish and cover with foil while making the gravy.Â Bring the pan drippings to a boil over medium heat. Dissolve the flour in 1/2 cup water then stir into the drippings, boiling and stirring until thickened. You can either serve the gravy on the side, or smother those chops up front. Either way, it’s all good. Stuffed with a mixture of bread, craisins, and pecans, then baked in Moscato wine, these pork chops are out of this world. Trim crust from bread, and cut into ¼-inch cubes. Set aside. Heat butter in a large skillet, and add the onion and celery, stirring until onion is golden (about 5 minutes). Toss in bread cubes, and stir to combine. 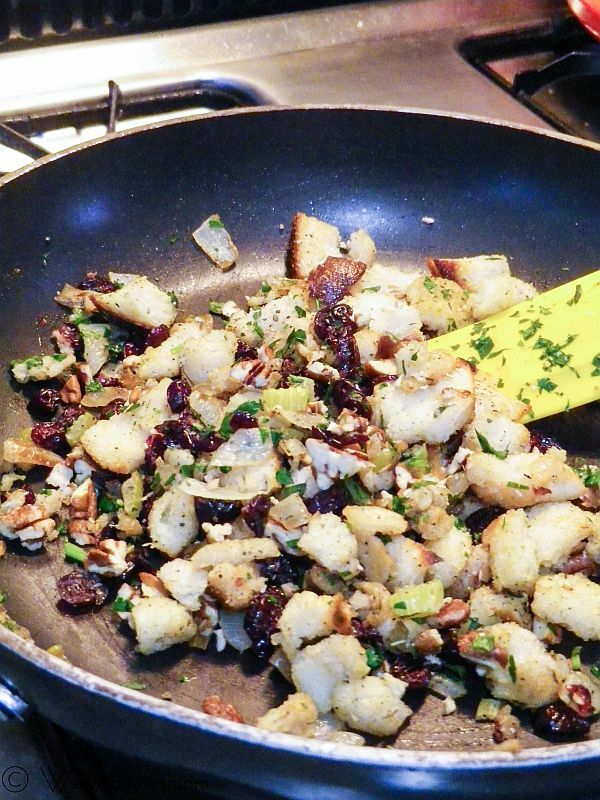 Stir in parsley, craisins, pecans, salt, sage, and pepper, and toss lightly to combine. Using a sharp paring knife, cut a pocket in each chop, all the way to the rib. Fill each pocket with ¼ of the stuffing, and fasten together with two wooden toothpicks. Melt the butter in a large skillet over medium heat and brown the chops well on both sides (about 10 minutes on each side). Remove chops from the pan, and deglaze the pan with the Moscato wine. 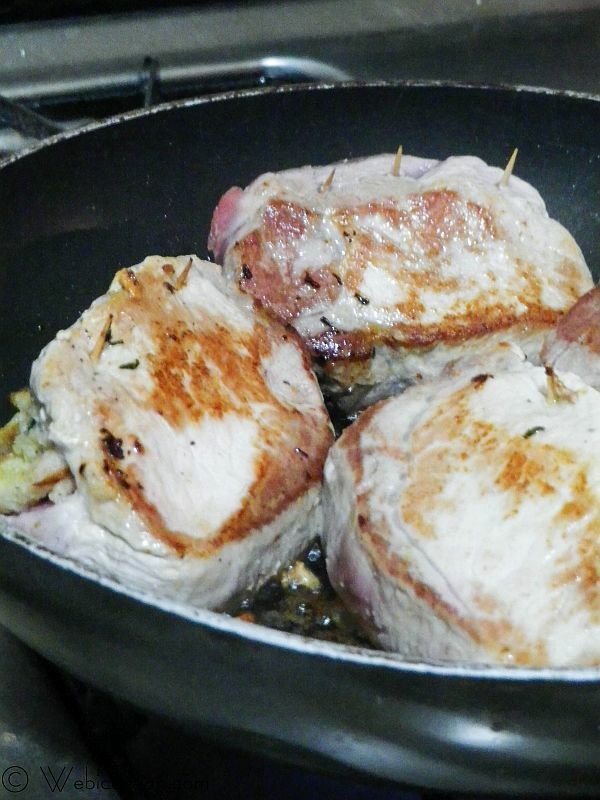 Pour wine/juices into a medium-sized roasting pan, and stand the pork chops in the pan. Cover with foil, and bake for 30 minutes. Remove the foil, then bake an additional 30 minutes or until the pork chops are done. Transfer the chops to a platter and cover to keep warm. On the stove top, bring pan drippings to a boil over medium heat. 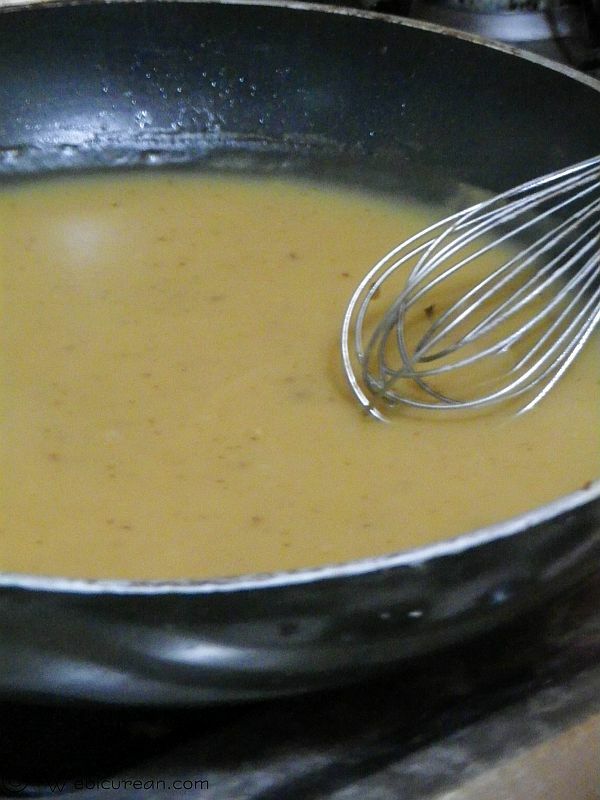 Dissolve the flour in ½ cup water, and stir into the drippings, boiling, and stirring until thickened. Strain before serving. 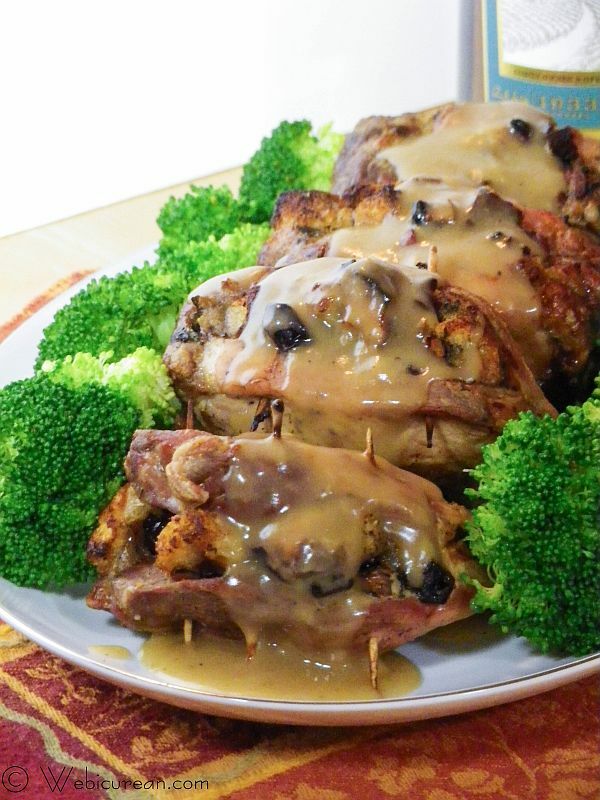 Serve stuffed pork chops with the gravy on the side. Oh, and for a little family fun, use Gallo’s online tool to create a custom family crest like the one above. Let’s take a look at what the others have cooked up! Oh yummy! This is a recipe I believe will get my husband to like pork chops. I’m sure of it. I can’t get my eyes off the gravy. And, the stuffed pork chops look divine too! It has been too long since I have made stuffed pork chops. These sound delicious! Way to go and that gravy…. yum! I haven’t made stuffed pork chops in forever but yours sound so good! Especially that gravy on top! Yummy! Oooh, we love stuffed chops and yours look fantastic!!! And the sauce sounds incredible, too! Wow this looks amazing! I just read the recipe out loud to my Mom and we are trying this recipe ASAP! Happy Holidays to you! These Pork Chops have me drooling! Beautiful recipe and photography. These pork chops look absolutely scrumptious! And you managed to make them look beautiful too. You’re amazing! Haha, vinyl tablecoths! I was surprised with how well the Moscato worked in a savory dish, as well. Your chops look amazing! Pinned it Anne my mouth won’t stop watering this looks so good! This is a great big WOWSER of a meal! I actually WAS thinking that dessert wine wouldn’t be so great inside dinner, so thank you for setting me straight! Love this! 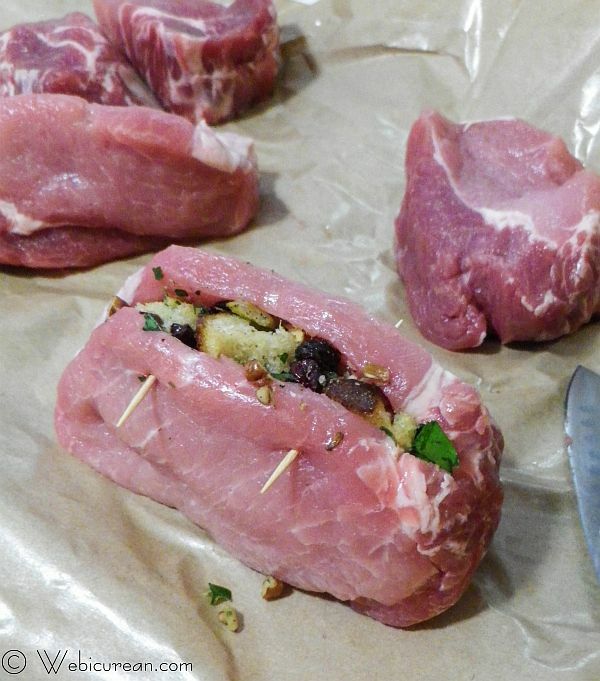 Stuffed baked pork chops was one of my favorite dishes that my mom made when I was a kid. But she never made Moscato gravy. Now I feel deprived. That’s a GREAT idea. This whole dish sounds so good especially that luscious gravy! 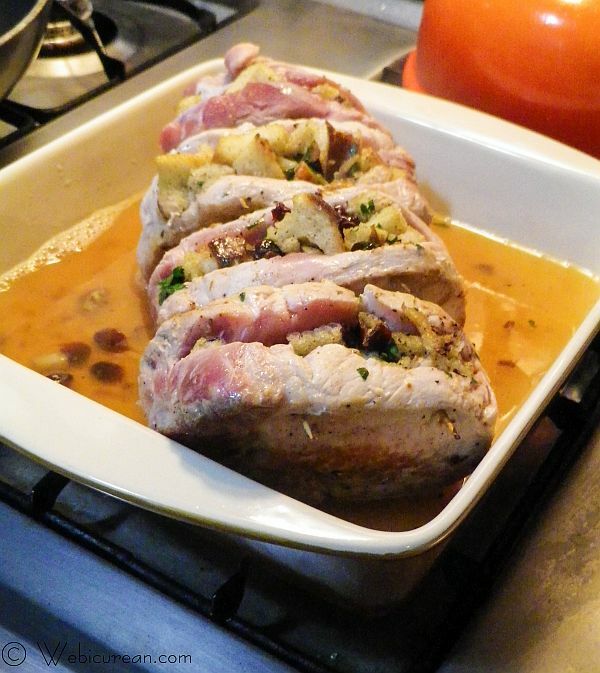 I love the sweet and nutty combo in your stuffed pork chops! 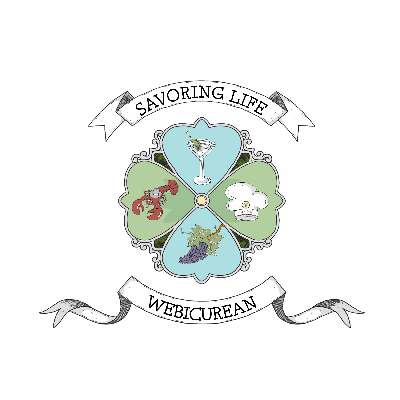 And, white wine gravies are SO delicious! I love that picture of your Uncle Joe! What memories and now oh those pork chops, wow incredible, I could go for some right now. Wow, This is the perfect dish I was looking for! Thank you for sharing.